Undercover KGB officers Nadezhda and Mischa pose as travel agents Elizabeth and Philip Jennings, a married American couple living in suburban Washington, D.C. in the 1980s-set The Americans. Complicating matters for the couple is hiding their life of espionage from their two kids, as well as from the American government, including their next door neighbor, FBI agent Stan Beeman. Their pretend marriage evolves into a real one as the series progresses, as does the toll of keeping a heavy secret and committing crimes against a country to which they've acclimated. 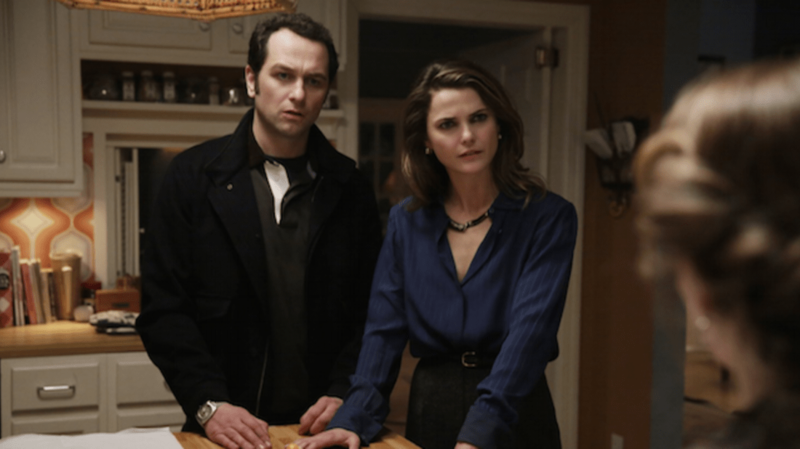 Here are some declassified facts about The Americans, which is currently nominated for five Emmy Awards, including Outstanding Drama Series. 1. IT WAS CREATED BY A FORMER CIA AGENT. 2. THE PILOT WAS BASED ON A 2010 FBI INVESTIGATION ON RUSSIAN SPIES. The FBI busted a Russian spy ring in 2010, which revealed that 10 Russian spies had been living undercover in suburbs throughout the United States for more than a decade. "Some pulled off some real espionage of note, but more often, they would come over, open a business, and try to get a cover going," Weisberg explained. "Then the business would fail, the spies would start telling some lies back home, and then they would sort of disappear. That’s who was arrested in 2010, and Philip and Elizabeth are the 1981 version of those espionage officers." 3. JOE WEISBERG WANTED TO SET THE SHOW IN THE 1970s. "My initial inclination when I decided I wanted to set the pilot in the Cold War was to go ’70s, strictly because I loved the hair and the music," Weisberg told The A.V. Club. "But I started thinking about Jimmy Carter—and I love Jimmy Carter too, actually—but it was hard to think of things getting too hot and everybody wanting to kill each other too much under Jimmy Carter. Then we started thinking about Ronald Reagan, and everything immediately clicked." 4. CASTING KERI RUSSELL AND MATTHEW RHYS WAS NOT WEISBERG'S IDEA. FX Network president John Landgraf suggested Keri Russell. Leslee Feldman, head of casting at DreamWorks, suggested Matthew Rhys after seeing him in a play. Casting Margo Martindale to play the couple's handler, Claudia, was also Landgraf's idea. In 2015, Martindale won an Outstanding Guest Actress in a Drama Series Emmy for the role; she's nominated for the same award again this year. 5. KERI RUSSELL AND NOAH EMMERICH WEREN'T IMMEDIATELY SOLD ON THE SERIES. Russell loved the pilot script, but she wasn't ready to commit. "I didn’t know that I wanted to do it," she told The Huffington Post. "I always say no to everything. I never want to do anything. But I just couldn’t stop thinking about it. I read it, and it was one of those things where I was riding my bike around Brooklyn or doing the dishes, and I kept trying to figure it out, because it’s so not clear. It’s still not clear to me. But there’s so many different levels to it." Noah Emmerich, who plays Stan Beeman, didn't want to do a TV show where his character would carry a gun or a badge. "I'm done with guns and badges," he thought. But executive producer Gavin O'Connor, who directed the pilot, told Emmerich, "You're crazy if you don't think that you should do this." 6. WEISBERG TAUGHT THE CAST AND CREW SOME SURVEILLANCE TECHNIQUES. Before shooting for the series began, Weisberg taught the leads and some of the producers and directors how to surveil others and how to recognize if you're being followed. One trick he taught them is that if you just cross a street, you can look around without drawing suspicion. 7. THE CIA READS EVERY SCRIPT THAT WEISBERG WRITES. Every one of Weisberg's scripts must be submitted to the CIA's Publications Review Board one month before shooting. "They ask for a month, and we don’t really have that much time, so I send them in with what’s called a request to expedite," Weisberg told Slate in 2013. "I always feel a little bad about it: 'Dear Publications Review Board, here I am again asking for the expedited review ...' There haven’t been any occasions yet where they’ve asked me to take anything out of a script, which is what I expected, because I haven’t worked there for a number of years at this point. I still worry a little bit, though. Before giving the demonstration of surveillance techniques, I had to submit a request ahead of time, but that was approved also." 8. 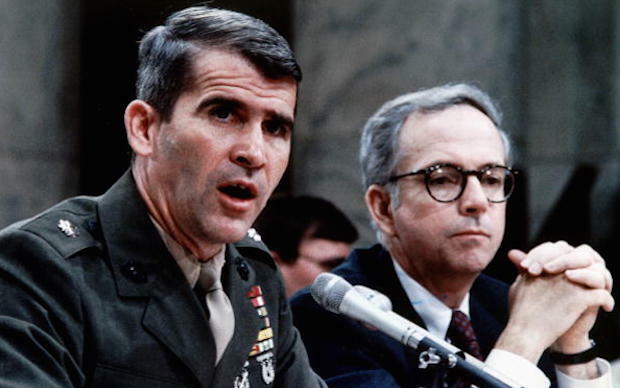 OLIVER NORTH HELPED WRITE AN EPISODE. For the season two episode "Martial Eagle," where Philip and Elizabeth attempted to infiltrate a contra training camp, producers sought out someone within the Fox network family who was familiar with the Nicaraguan contras of the 1980s, which is how they ended up with former Marine Corps lieutenant colonel and Fox News personality Oliver North. North provided so much information that he was given a story credit on the installment. 9. IT'S SHOT IN NEW YORK CITY. Uptown Manhattan typically doubles for Washington, D.C. They also film in Staten Island, Brooklyn, and Queens, which has been dressed as West Germany. To maintain its period setting, the production team regularly has to remove flat-screen TVs, digital thermostats, refrigerators, and gas stoves from certain premises. 10. SOMETIMES, THE PRODUCTION DESIGN IS A LITTLE TOO GOOD. "On our first episode, we had a scene [where] Keri Russell walks out of a bar, except it wasn’t a bar, it was an empty storefront, and we just dressed the front of it," production designer Diane Lederman told DNAinfo. "And all day long, people kept coming up and wanting to know when the new bar was opening." 11. THE WRITERS MAKE SURE PHILIP AND ELIZABETH DON'T CHANGE HISTORY TOO MUCH. The writers decided not to have Philip and Elizabeth destroy Ronald Reagan's Strategic Defense Initiative project, a.k.a. Star Wars, on the show. "We ... talked a lot about, should we have Philip and Elizabeth as the spies who destroy Star Wars?" Weisberg told The A.V. Club. "Should we work on the secret history, and have it be that Star Wars really could have worked, but our guys prevent it from working? And we had some really compelling stories along those lines, but also we felt it was taking too much liberty with the history. Even though it would be a lot of fun and make our heroes very heroic, at least to Moscow, it would warp our sense of reality for the show a little too much." 12. HOLLY TAYLOR WAS SURPRISED THAT PAIGE LEARNED THE TRUTH ABOUT HER FAMILY. "It was in the middle of the season in the middle of an episode," Holly Taylor, who plays the Jennings' daughter Paige, recalled of learning that her character would be let in on the family secret. "It was very unpredictable, which is one of the great things about the show, it's always that way. I love the way that they did it ... We did that scene so many times and a bunch of different ways. All of us were sitting at the kitchen table on set just staring, zoned out, because it was just so draining filming that scene." 13. PAIGE'S VINTAGE WARDROBE IS PAINFUL (LITERALLY). 14. THEY GOT PERMISSION TO USE THE SONG "UNDER PRESSURE" TWO DAYS BEFORE DAVID BOWIE'S PASSING. Dire Straits's "If I Had You" was the initial choice of music for the season four episode "Clark's Place," but when they heard how well Queen and David Bowie's "Under Pressure" worked in the director's cut, Weisberg and showrunner Joel Fields sought out clearance. They quickly discovered that their music supervisor had emailed them about a year earlier saying Bowie was a fan of The Americans and using one of his songs would not be a problem. 15. FRANK LANGELLA THOUGHT HE WAS A GONER. © Copyright 2015, FX Networks. All Rights Reserved. Frank Langella portrays Gabriel, Philip and Elizabeth's current KGB handler. "At one point I thought they were going to kill me because there was a scene where I sort of got down on the floor and said, 'I’m sorry. I need to sit down. I don’t feel well.' I thought oh, the next episode would be that—I was dead. But so far they haven’t killed me. It’s a good year." 16. IT'S ENDING IN 2018. A 13-episode fifth season in 2017 will lead into a 10-episode sixth and final season in 2018. Fields and Weisberg have described the recent fourth season's conclusion as the end of the second act of what they consider to be a three-act play.